Polymorphic light eruption is a fairly common skin rash triggered by exposure to sunlight or artificial ultraviolet (UV) light. An itchy or burning rash appears within hours, or up to 2 to 3 days after exposure to sunlight. It lasts for up to 2 weeks, healing without scarring. The rash usually appears on the parts of the skin exposed to sunlight – typically the head, neck, chest and arms. The face is not always affected. Polymorphic light eruption is thought to affect about 10% to 15% of the UK population. Polymorphic light eruption can be easily mistaken for prickly heat. Prickly heat is caused by warm weather or overheating, rather than sunlight or UV light. The skin in prickly heat does not "harden" or desensitise, as it can do in polymorphic light eruption. The rash may be a rare occurrence or may happen every time the skin is exposed to sunlight. It ranges from mild to severe. Sometimes, as little as 30 minutes of sun exposure is enough to cause the problem, and it can even develop through thin clothing or if you're sitting near a window. However, for most people with polymorphic light eruption, the rash develops after several hours outside on a sunny day. If further sun is avoided, the rash may settle and disappear without a trace within a couple of weeks. It may or may not return when skin is re-exposed to sunlight. If the skin is exposed to more sunlight before the rash has cleared up, it will probably get much worse and spread. 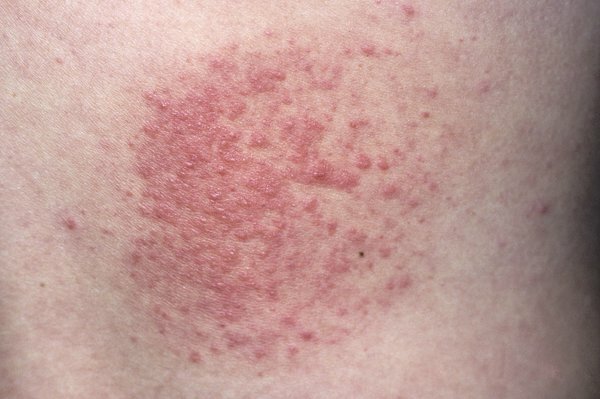 For many people with polymorphic skin eruption, the rash appears every spring and remains a problem throughout summer, before settling down by autumn. Polymorphic light eruption is more common in women than men. It particularly affects people who are fair, although it can also affect those with dark skin. It usually starts between the ages of 20 and 40, although it sometimes affects children. Polymorphic light eruption is thought to be caused by UV light altering a substance in the skin, which the immune system reacts to, resulting in the skin becoming inflamed. It can run in families – about a fifth of people with the condition have an affected relative. It's not infectious, so there's no risk of catching polymorphic light eruption from another person. There's no cure for polymorphic light eruption, but using sunscreens and careful avoidance of the sun will help you manage the rash. Avoid the sun, particularly between 11am and 3pm when the sun's rays are at their strongest, and wear protective clothing when outdoors (unless you're hardening your skin). Introduce your skin to sunlight gradually in the spring. You may be prescribed sunscreens to help prevent the rash developing. Use a sunscreen that is SPF 30 or above with a good UVA rating. Apply it thickly and evenly, reapplying often. Watch a video on how to apply sunscreen. Your GP can prescribe corticosteroid (steroid) cream or ointment that's only applied when the rash appears. You should apply it sparingly, as often as your GP advises, and never when there's no rash. It's sometimes possible to increase the resistance of your skin to the sun. This involves visiting a hospital dermatology department 3 times a week for 4 to 6 weeks in the spring. Your skin is gradually exposed to a little more UV light every visit to try to build up your skin's resistance. The effects of desensitisation are lost in the winter, so you'll have to build up your resistance again in the spring. You may be able to increase the resistance of your skin at home. This is known as "hardening" and involves going outside for short periods in the spring to build up your resistance. You might find the time is as short as a few minutes at first, but you may be able to gradually build up to longer times. You'll have to be careful not to overdo it but, as you begin to understand more about how much light triggers your rash, you'll be able to judge how long to stay out. Like desensitisation, the effects of hardening are lost in the winter, so you'll have to build up your resistance again in the spring. People with polymorphic light eruption are at greater risk of vitamin D deficiency, as a certain amount of sun exposure is needed to make your own vitamin D. Your GP will advise whether you need treatment with vitamin D supplements. Many people with polymorphic light eruption find their skin improves over the years. Your skin may harden (become more resistant to sunlight) during the summer, which means more sun can be tolerated without your skin reacting. The rash may even eventually clear up on its own, although this is unusual. Hardening of the skin does not always happen, and some people with very sensitive skin may even get the rash in the winter. For these people, it may be a long-term condition to manage with lifestyle changes and creams.